It’s no secret…Josh and I LOVE to travel. We love it SO much that we sold EVERYTHING we owned in 2015 and moved to Singapore. Yep, left it all. Why? TO SEE THE WORLD, SILLY GOOSE! In 2015, Josh had NEVER left the USA and now, we’ve been to 46 countries…crazy, right?! Soooo we like to think we have a descent grasp on some of the coolest parts in this incredible world-specifically in Asia and Europe. I’m also super super partial to our current home city, Miami, which isn’t included on the list because I’m speaking about OTHER destinations other than my own city. I’m so happy you’re here to check them out, so first I want to thank you for actually caring about our opinion. And second, I want to ask you…whats your top 15…or 10…or 5?! Tell me in the comments below or send me a message on Instagram! DO NOTE: we haven’t explored South America, North America (Canada, I’m coming for you babe) or Africa yet (besides Egypt), so please take this into consideration! Here’s our list! Happy Reading! I know what you’re thinking…you said 15 Nichole. What’s with the 18? Well, I started with 15 and then realized I was forgetting a few and that was just criminal, soooo here we are! 18 sounds nice, right? Lucky 18! Switzerland is incredible. The landscapes are literally like a postcard at every single turn. I had to pinch myself the entire time we were there because the scenery didn’t feel real. Unfortunately, Switzerland is expensive AF, so we were only there for 3 days, but we sure made the best of it! Check out my Blog Post- A 2-Day Road Trip of Switzerland to learn how we budgeted enough to stop in 7 cities in just three nights! Halong Bay is indescribable. It is pure magic to glide through the water on a boat surrounded by giant limestone karsts. So silent and still. Just perfect. Halong Bay was MUCH more massive than I thought and I wished we had stayed 3 nights on the water instead of two. 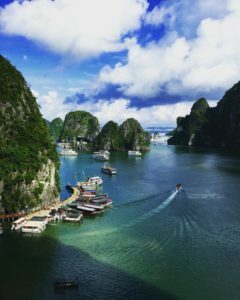 The Vietnamese are some of the kindest and most gentle people we’ve ever encountered and their culture, together with these picturesque views, makes Halong Bay a MUST SEE. For more information about Halong Bay (how to get there, where to stay, etc. ), check out my Blog Post: Halong Bay in 3 Days. New York has my heart. Maybe it’s because Josh proposed to me in Central Park…or maybe its the just the city buzzzzz…. (I love big cities). What’s not to love about NYC? Want to know something funny too? I didn’t even like it the first time we went (wtf was wrong with me?)! Fortunately, now each time we venture to the Big Apple, I fall more in love with its architecture, food, people and culture. New York has it going on and I just couldn’t leave it out. I have SO much left of the city to explore and I can’t wait to go back again! 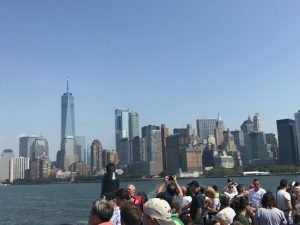 Check out my Blog Post- New York City: The Best of the Big Apple for all the details on visiting this unforgettable city! I’m going to be honest here, and some of you are probably going to punch me for it, but I didn’t really LOVE Rome and Venice (sorry guys)! 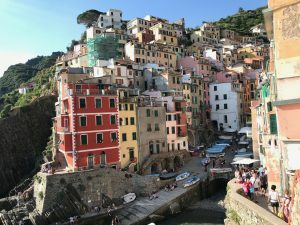 I completely appreciated them for the cities they were, but I was pretty disappointed with Italy (maybe I hyped it up too much)…until we went to Cinque Terre (and Positano)! WOW, is all I have to say! Cinque Terre literally translates to “5 Towns” and it is ABSOLUTELY STUNNING! These colorful towns are nestled on the coastline and are like nothing we’ve ever seen before. If you go, be SURE to do the hike from Monterosso to Corniglia (FYI, it’s not easy). You can read more about the hike and the towns in my Blog Post- Cinque Terre in 48 Hours. While the city of Beijing is our least favorite from all our travels (message me if you want to know why), the Great Wall of China is absolutely incredible. It’s impossible to describe to you how it feels to stand on that wall…I cried! There’s SO much history and beauty in the Wall, that it certainly cannot be missed. If you’re planning to go, you MUST take the extra time and visit the portion of the Great Wall at Mutianyu, which is located 40 miles (65km) north of the city of Beijing. There are FAR LESS crowds here, especially if you go super early. Josh and I literally had the entire wall to ourselves for hours (note we were there in off season). For more details on our Great Wall adventure, check out my Blog Post- Beijing-China’s Capital City. What kind of person would I be if I didn’t put the country we lived in for 2 years on the list?! But seriously, though, Singapore is the bomb. You will never find a more clean city anywhere in the world. Combine that with delicious food from all over the world and the coolest architecture known to man (Google Marina Bay Sands and the Super Trees if you don’t believe me)… Singapore will leave you speechless. If you’re planning to go and can fit in the budget, be sure to stay at Marina Bay Sands. I love this country SO much that I wrote a book about it! It’s called Greater Than a Tourist: Singapore- 50 Tips From a Local. Check it out on Amazon! 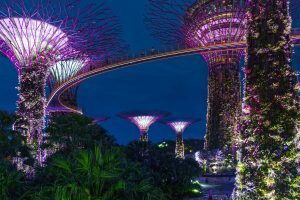 In case you’re craving more info about Singapore, check out My Ultimate Guide to the Lion City, 10 Things You MUST Do in Singapore, and my 3 Day Itinerary of Singapore. Josh and I are TOTAL SUCKERS for blue water and beaches, so it’s no surprise that we fell in love with the Maldives (seriously, who wouldn’t though)! While this is the most expensive destination we’ve ever been, I highly suggest it, because it literally is the most beautiful place on the planet. There is nothing like waking up every day in your ocean villa and stepping three steps down into the water where you’ll see snorkel with colorful fish (Dori and Nemo), coral reefs and maybe an octopus or baby shark if you’re lucky! The Maldives also offers up some the best sunsets we’ve ever seen. If you’re planning to go and are on a budget (please note that budgets don’t really exist here if you’re looking for a resort), I highly suggest booking an all inclusive, because food and alcohol is crazy expensive! 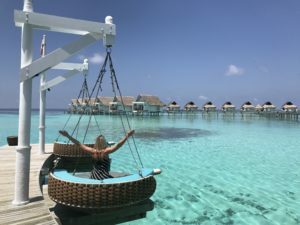 For more details on our trip and where we stayed, check out my Blog Post- Maldives: Pure Heaven on Earth. There is no other city like Dubrovnik, Croatia. The entire old town streets are made of glistening white marble, which brings such a luxurious feel to it. Not to mention that walking the city walls is an experience like no other. You’ll be perched above the city, looking down over its red roof tops, surrounded by the beautiful Adriatic Sea. Croatians are incredibly kind people and, when you add that together with the local seafood, you’ll never want to leave! 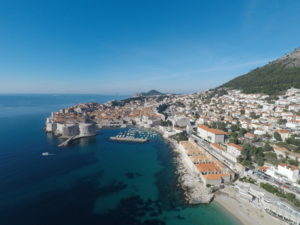 We loved Dubrovnik SO much that we extended our one month stay to 6 weeks! Pro Tip: Dubrovnik is CRAZY busy in the summer time with cruise ships unloading people by the thousands, so if you want more of an authentic experience, visit during the off season. We went in January and we literally had the entire city walls to ourselves (compared to summer time when there is an hour+ wait to even get on the walls). Also, if you’re a Game of Thrones Fan (we LOVE the show-I heart Jon Snow), then I’m sure you’ll want to visit because this is the home to King’s Landing! If you’re planning to visit, save your money on a tour and check out my Game of Thrones Tour, which walks you through all the top sights. If you’d like more info about the city (what to do, where to stay, etc.) you can read my Blog Post- Dubrovnik, Croatia: The Best of the Balkans. Amsterdam is such an incredibly cool city and, since we are such active people, we fell in love with the biking culture there. There are an estimated 847,000 bicycles and only 442,693 households! Crazy right? If you go to Amsterdam, you MUST rent a bike (around $10 a day) and simply explore. You’d be doing yourself a disservice if you didn’t. The canals add so much charm to the city and, when you combine that with some of the friendliest people we’ve ever met, you’ll never want to leave! 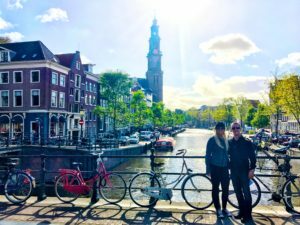 Check out my Blog Post- Amsterdam, Netherlands: The Venice of the North for more info on what to do and the #1 restaurant that you CANNOT miss when you go! If you haven’t been to Lagos, I need you to open a new web page right now and book a flight. I’m SERIOUS! If you love beaches, sunshine and epic scenery than Lagos is THE place for you. The town itself is really quaint and beautiful as well and I feel like it doesn’t get enough credit because everyone is always posting about the beaches. The windy, cobble stone streets are so fun to explore. You could get lost in all the boutique shops and eat until you burst with fresh seafood. I’ve been to Lagos twice and I seriously want to go back tomorrow! Make SURE you take a kayak tour when you go to really get up close and personal with the caves and secret beaches. You won’t be disappointed! 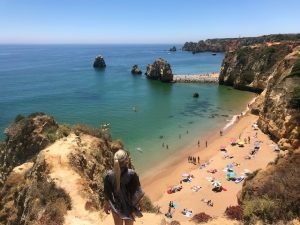 For more info on this unforgettable city, check out my Blog Post: The 6 Best Beaches in Lagos, Portugal. I had a tough time choosing between Athens and Santorini for this one. Athens is TOTALLY underrated and we had many people tell us to skip it because it wasn’t anything special. I couldn’t disagree more! Athens has SO much soul and the food is SOOOOO good! When you go, you MUST take a food tour with Greeking.me. Enter my discount code BLONDIE for a 10% discount on both small tours and private tours! You can also check out my Blog Post: 10 Foods You MUST Eat in Greece for more info! So now that I’ve poured my heart out to you about my indescribable love for Athens, Santorini is next in line. Although pricey and crowded (we even went in the off season and it was quite busy at sunset), Santorini is such a beautiful place. There is nothing quite like the white washed buildings with blue rooftops. 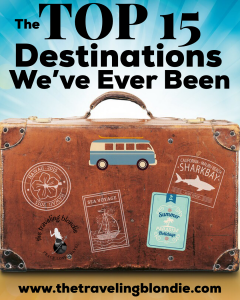 It’s a place that must be on your travel list! 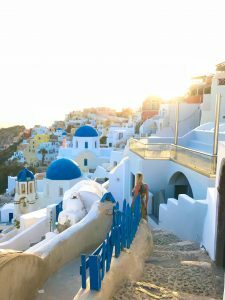 For more info on where we stayed, where to eat and what to do check out my Santorini Travel Guide. 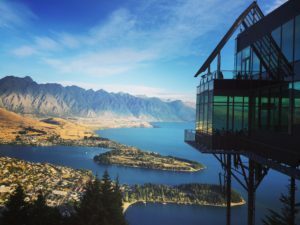 Queenstown is the adventure capital of the world and, once you visit, you’ll know EXACTLY what I mean! Even if you’re not into skydiving, bungee jumping, snowboarding or other extreme activities, you can absolutely still fall in love with the city. Why?! Because it’s SOOOO beautiful! There is nothing like waking up at your Airbnb on the beautiful Lake Wakatipu with mountains everywhere you look. Once you venture into town, you’ll quickly realize that New Zealanders are some of the coolest people you’ll ever meet and they also make the most DELICIOUS food you’ll ever eat. Josh and I wanted to move to Queenstown, that’s how much we loved it! I’ve written SO many Blog Posts on New Zealand, it’s hard to count, but if you’re going for the first time I highly suggest reading A First Time Guide to the South Island and 5 Hidden Gems in the South Island. The Philippines is the most underrated place that we’ve ever been. I honestly don’t even know how it was never on my radar until we moved to Singapore and heard about it. WOW, what an incredibly gorgeous place! 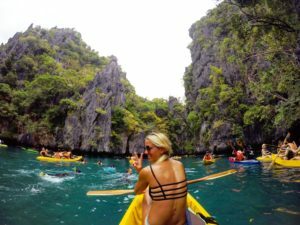 If you love diving, snorkeling, beaches, clear-blue water, boating, kayaking, and zip-lining, then El Nido is THE place for you. Of all the countries we’ve dived in, El Nido had the best visibility and the most colorful fish, turtles and reefs. When you go, be SURE to take a boat tour to the Big and Small Lagoon and other small islands. And DO NOT MISS ONE SUNSET while you’re there, they’re some of the best we’ve ever laid eyes on! For more info on this paradise, you can read my Blog Post- El Nido, Palawan: Heaven on Earth. Bali Bali Bali Bali Baliiiiiiiiiiii! We LOVE Bali! Fortunately, we were able to venture to Bali multiple times, with a combined total time on the island of 3 months! So I like to think we know what we’re talking about when it comes to this unforgettable island. 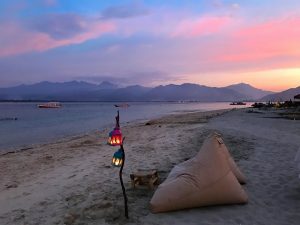 We received our dive certifications on Gili Air and even spent an entire month on Nusa Lembongan (both are small islands off the coast of Bali) getting certified to be yoga instructors. So, needless to say, we have a massive connection with this part of the world. The coolest part about Bali is that in one day you can be in the deep jungle of Ubud, then venture to the coast and take in some of the most gorgeous cliffs, sunsets and beaches you’ve ever seen. I’ve written SO many Blog Posts about Bali, but I highly suggest checking out The PERFECT Bali Itinerary, How to Survive for 30 Days on a $500 Budget, and the 10 BEST Things to Do in Bail if you’re planning to go. As much as we are beach people, we are equally big city people. 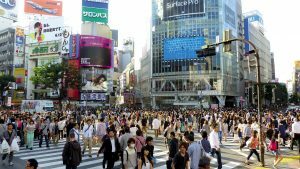 To us, Tokyo is one of the greatest cities in the world. The food is mouthwateringly delicious-I think I gained 10 pounds in 3 days. Crepes, sushi, ramen, Yakitori, Kobe/Wagyu Beef Skewers, Osaka Takoyaki, Onomomiyaki, and Taiyaki! We think its the best food in the world (besides Thailand). That being said, when you go, you MUST take a food tour. I never would’ve known about 80% of the different delicious foods that exist in Tokyo had we not taken the tour, so you can’t miss it! Aside from food, Tokyo also offers super cool architecture, fun nightlife, incredibly kind people and SO much more! For more info on our visit to Tokyo, including our food tour, check out my First Time Guide to Tokyo and my 3 Day Itinerary for Tokyo. Remember how I told you that we love beaches and clear ocean water? Phi Phi island takes the cake in that department. Not just the cake, the whole damn bakery. This place is mind blowing. Sadly, the reef and vegetation in Maya Bay (where the movie The Beach with Leonard Dicpario was filmed) has taken a serious beating with tourism, so it’s currently closed. That shouldn’t deter you AT ALL from going, as the entire island of Phi Phi and it’s surrounding islands offer up so much beautiful scenery. Josh and I LOVE Thailand (which is why it’s #2 on our list). We love the food, the people, the scenery…everything! For more info on the island, check out my Blog Post- Phi Phi Island, Thailand: A Magical Place in Southeast Asia. Finally I can talk about our #1! Did you guess I’d say Egypt? Our entire lives Josh and I have wanted to go to Egypt. Since I opened a book when I was 6 and read about the Great Pyramids of Giza, the badass Queen Hatshepsut and the Karnak Temple, I’ve been dying to go. I’ve dreamed of seeing King Tut’s Tomb with my own eyes and walking in the same place these great Pharaohs stood thousands of years ago. And this past April we went and it was indescribably life changing! I literally cried when I saw the pyramids! Wept. Like. A. Little. Girl. There is no way to physically describe the feeling and energy there…I’ve never experienced anything like it. When you go, I highly suggest hiring a private tour guide, as they are insanely affordable and they give you SO much info you’d never know without them. Plus they take care of transportation, which can be a bit challenging (Cairo traffic is absolutely nuts). Book your trip, I promise you’ll love it! 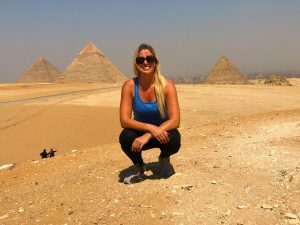 For more info on our trip to Egypt, check out my Blog Post- Egypt: Finding Inner Peace at the Pyramids. Soooo what do you think? Did I miss anything?! What else do you think should be on my list?! 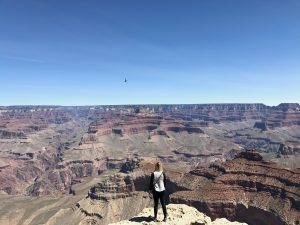 It’s SO SO hard to choose between all the countries we’ve been and I’m SURE this list will change once we’ve explored more of North America, South America and Europe! Stay tuned, beautiful people!